By now, most of my regular readers know how much I adore citrus…its refreshing, bright flavor is the perfect accent in so many of my favorite recipes. Citrus adds freshness and zing to everything from seafood to desserts. Today, I’m going to introduce you to a variety of orange that you might not have heard of before: the cara cara orange. Gosh…even the name sounds exotic! Frieda’s, a California-based specialty produce company, sent me some of these fantastic oranges to sample, share my thoughts with you, and feature in a recipe. I totally loved this seedless naval orange!! Their flavor is tart-sweet, with subtle berry undertones…but they're not overly acidic. 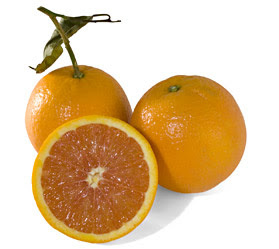 Cara cara oranges are gorgeous inside as well…the flesh is a pink-orange color similar to grapefruit. I initially considered juicing my cara cara oranges to make a fun weekend cocktail. Then? I decided to make a salad that would showcase the beautiful pink-orange color of these oranges. I found a fantastic recipe online that combines some of my favorite flavors and textures, and I tweaked it a bit to make it my own. This salad combines baby field greens, cara cara orange segments, avocado, feta, and spiced pepitas. It's tossed with a light vinaigrette that incorporates cara cara juice. This salad would make a fantastic light Lenten meal on its own, but I paired it with pan-seared fish. You could easily sear a few jumbo shrimp in some olive oil and add them on top just before serving for a yummy main dish salad! Step 1: Add 1/4 cup salted pepitas (pumpkin seeds), a few drops of vegetable oil, and 1 tsp. of Cajun spice to a small non-stick skillet. Toast the pepitas over medium heat, stirring frequently, until they are golden brown. This takes about 5 minutes, but make sure to stir every few minutes so they don't burn. Turn off heat and set aside until you assemble the salad. Step 2: Make the vinaigrette by combining the following ingredients in a measuring cup: 1/4 cup canola oil, the juice of half a cara cara orange, 1 tbs. red wine vinegar, 1 tbs. honey, 1 tbs. finely minced shallot, 1/2 tsp. grainy mustard, 1/2 tsp. sea salt, and 1 tsp. dried parsley. Whisk well to combine. Step 3: Assemble the salad. Put 4 cups baby field greens in a large bowl and toss with most of the vinaigrette. Arrange the dressed greens on a serving platter. Top with the segments from one cara orange, half of a diced avocado, 1/2 cup crumbled feta cheese, and the pepitas. Drizzle the remaining vinaigrette on top just before serving. This salad is really fantastic…the combination of cara cara orange, creamy avocado, and salty feta was fabulous! The lightly spiced pepitas gave each bite the perfect amount of heat and crunch. The homemade cara cara vinaigrette brought all the flavors together very nicely. It’s a very light dressing that allows the flavors of the other ingredients shine through. This salad is as pretty to look at as it is to eat. I can see myself making this salad over and over again as we head into warmer months. Cara cara oranges are available from December through April, so try to pick some up while they’re in season. I think you’ll love them as much as I do! For my Texas readers, Frieda’s cara cara oranges are currently available in the produce department of your local HEB grocery store...so go out and buy some of these delicious oranges before they go away in a few weeks! !